I knew I couldn’t visit Naples without going to Pompei, but I had no idea how big or interesting it was. Showing up at 3 pm, an hour before the gates closed, then proved to be a bad choice, but then the guards told me that no one gets let in after 4, but people don’t get kicked out until 7. So I set off to get lost in the excavated city. 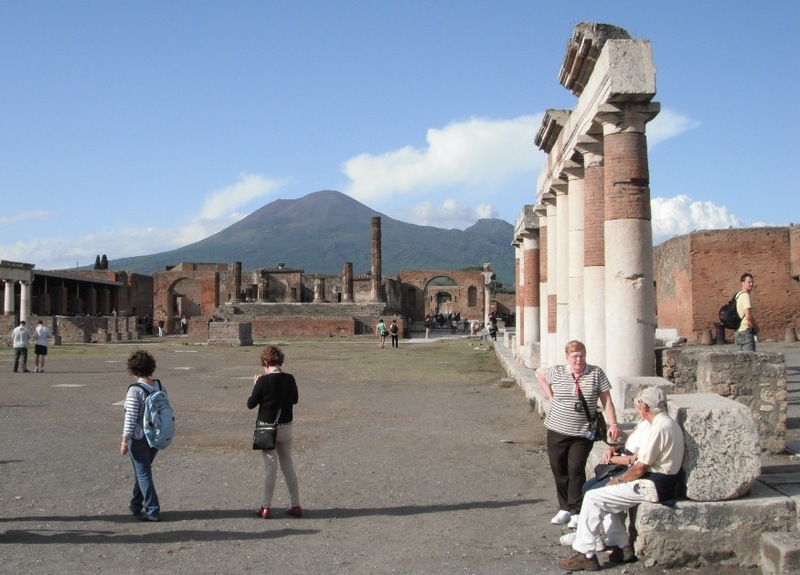 Mount Vesuvius as seen from the main square "Foro"
Pompei (sometimes spelled Pompeii) was a thriving Roman city until 79AD when the nearby volcano Vesuvius unexpectedly exploded. In only 2 days, the entire city was buried under 6 metres of ash and pumice. Up to 10 km away, people literally melted dead, dying from surges of hot air, but most suffocated to death before they could escape. The city was almost buried alive, keeping it perfectly preserved, so that walking around its ruins today seems like you’re eerily walking around a city that was deserted yesterday. I battled through tour group after tour group. Each had a dozen or more tourists, with a tour guide holding an umbrella or a stick tied with a scarf to lead them. Some had identical hats or lanyards, even tshirts, so they wouldn’t lose eachother, and some had earphones in their ear which were connected to the tourguide talking constantly into a microphone. German, French, Spanish, English, Japanese and Chinese… but no Italian groups. I would get lost in the midst of group after group, struggling to escape, since overtaking them was hard but getting stuck behind one wasn’t an option – since I wanted to get around the whole city in 4 hours. As I was wandering around, I passed a few other couples and backpackers, with handy guidebooks or talking headsets, and started regretting my choice not to join a group or hire a guide. There were so many things I didn’t understand, and hundreds of questions I wished I could ask a Pompeiian who was still alive. He first started at the city boundary wall that we happened to be standing right beside. He explained the markings on the wall were from the first Roman invasion, when the city was still a Greek colony. The invasion came from the north, another enlightening discovery for historians. To our left began the above-ground tombs, since dead people couldn’t be buried inside the city walls. He explained who was buried in each one, reading the legible Latin engravings on every stone, which told us who their father was, what their occupation was, and how much the burial cost. My fascination and obvious ignorance probably began to bleed through my smile. “Well, I don’t really need to go for a jog today anyway. 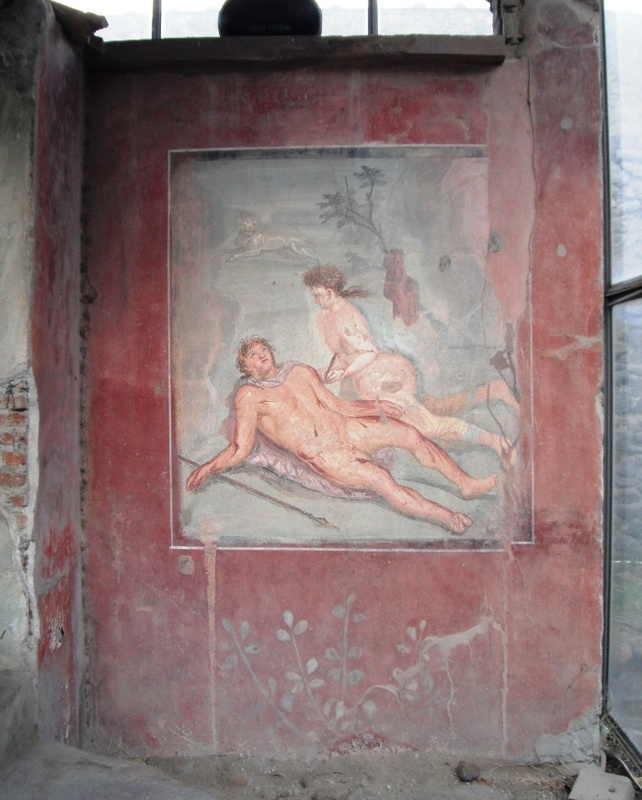 Im the head tour-guide of Pompei and have lived and worked here for 35 years, so why don’t I show you around a little?” He went on to give me a 3 hour personal tour guide, through all of Villa de Misteri and back into the city walls around the most interesting sights. 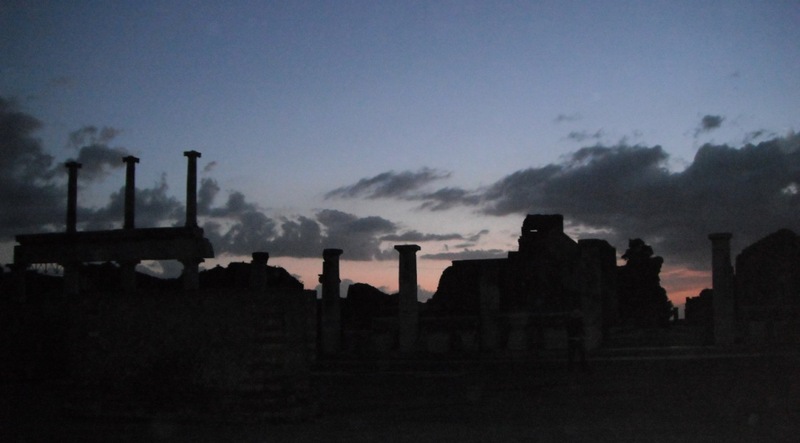 We stayed in the park well past dark, and he told the guards to let us be until 7:30 when we had all of Pompei to ourselves. He got keys from another guard to sneak me into inaccessible rooms, and showed me the bathing hall and the only chariot they unearthed, perfectly intact. We wandered around like kids, both partaking in a game of imagination that the city was thriving around us and I was a Roman princess courting Apollo. We walked into the Temple of Jupiter, which he refused to climb since he wasn’t Apollo’s love interest, and made sure I saw the brothel rooms which I never could have seen if I was really a Roman princess. He showed me the bodies of people, frozen in the position they were when they took their last choking breath. He pointed out the phallic engravings of penises in the weirdest places – on cobblestones on the ground, on the sides of pillars, in beautiful paintings – and assured me over and over they were signs of good luck, not perversion. He read every bit of Latin he could see, translating it into English word by word, and explained in great detail all the contested meanings of paintings. He pointed out original graffiti on the walls, of Roman emperors with big noses, and picked leaves off the Laurel trees to make me sniff and imagine them as my headcrown. 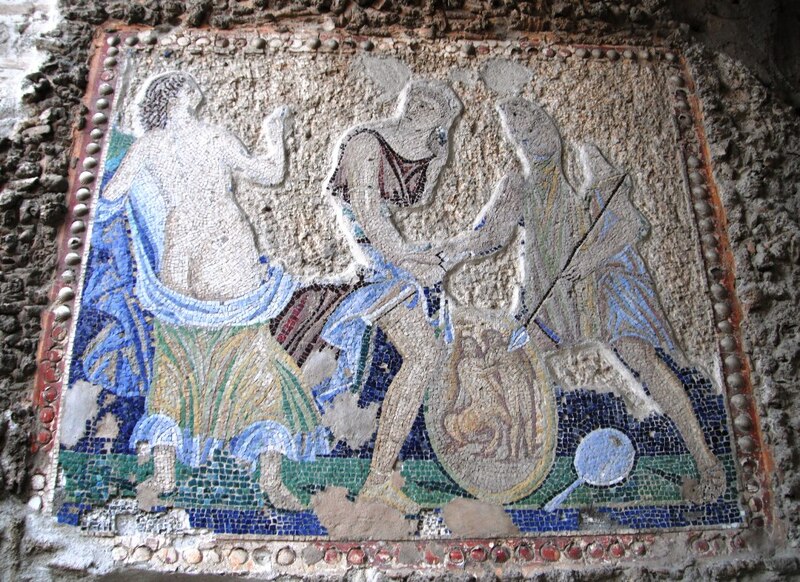 We walked over mosaic floors and looked at Egyptian decorations, as he got more and more excited about teaching me about the cultural complexity of the town and how much borrowing and trade there was between empires. He could never walk and talk at the same time. So we’d walk a few steps, and then he’d have to stop and explain something, and then we’d walk until I asked another question, which he would have to stop and answer. It was hilarious, and everytime I laughed at him, he laughed louder and harder until he abruptly saw something else to talk about and became totally serious, starting another fascinating lecture. He told me the population was probably 15,000, and explained which streets were the main streets, and even what they were called. During heavy rain fall, the streets flooded into small streams, and big stepping stones were used to get across the streets. 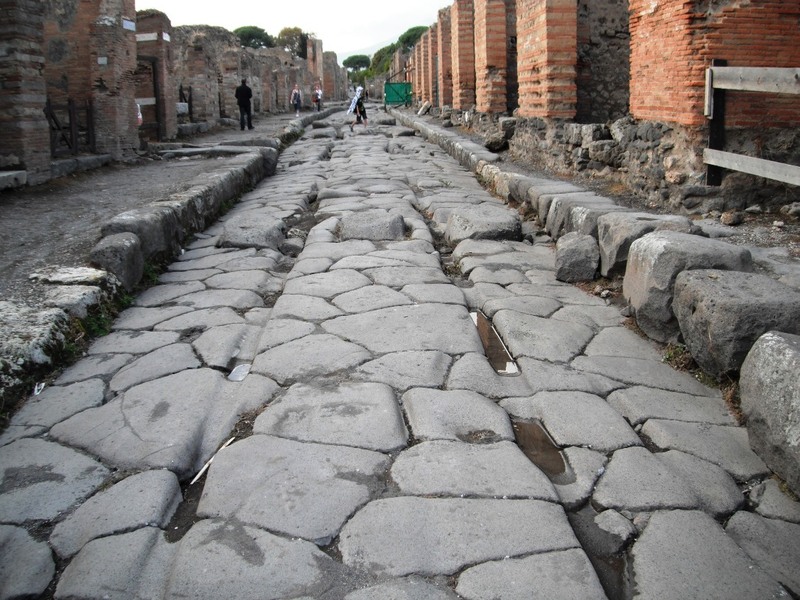 The high traffic of horse-drawn chariots actually left wheel tracks in the massive stones, which were supposed to be fixed by taxes collected from the people living on each street. He knew who lived in what house, and what they did. 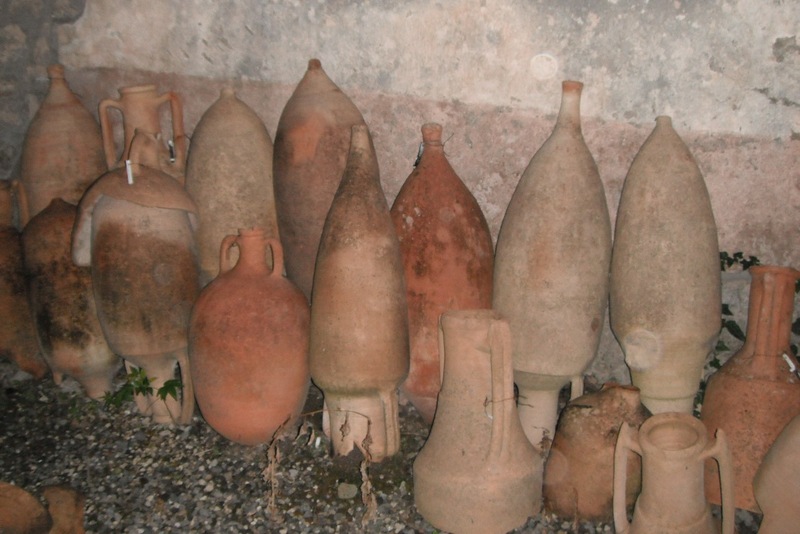 Many made wine and fishsauce, and kept them in big ceramic pots, and others were artists or bakers. There were athletes too, and gymnasiums where they trained for Olympic events – which they always competed in naked. The entire city came alive to me, and even as it became night, the cloak of darkness let me run wilder with what I thought I saw or heard. I felt like staying until the next morning to see the city return to life, since it seemed to real, so normal, for it to be exactly as I imagined it. 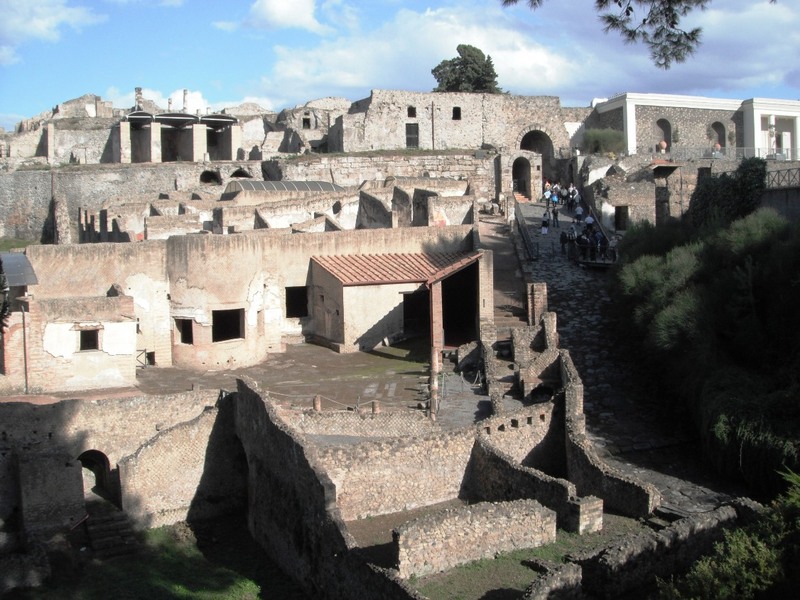 I never did go back the next day, even though my guide invited me, but perhaps its best I didn’t, since I may not have turned out to be a real Roman princess in the living Pompei.